I really enjoyed reading Belsky's thoughts on productivity and how to squeeze the most juice out of your ideas. This book is probably perfect for the most creative silicone valley types, but as an educator and administrator, I got a lot out of it. I'm probably never going to have an earth shattering business idea or product, but as an aspect of my job I need to be creatively considering ways to improve the school. 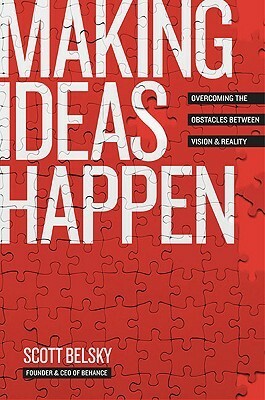 This book gave me some very practical tools and things to think about when trying to implement new ideas. Really great if you're either frustrated that your ideas never go anywhere, you begin but don't finish a project, or you find yourself stretched too thin over multiple projects. Great, easy read. Sign into Goodreads to see if any of your friends have read Making Ideas Happen. 23.05% "Quick, easy, and instantly applicable. Lots of good ideas here!" 43.36% "Easy read with LOTS of interesting ideas & stories."